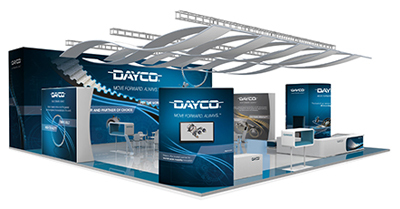 September 5, 2018 – Dayco will use the world stage afforded by Automechanika Frankfurt to present its new corporate branding to a global audience of the industry’s most influential people. These include the many valued technicians who rely on Dayco’s premium quality replacement components during their day-to-day working lives. The new branding is consistent across both the company’s original equipment (OE) and aftermarket products. This delivers a continuous message of quality and dependability, using modern graphics that support the company’s business ethos and core strengths. For more than a century Dayco has been recognized for its technological prowess and manufacturing abilities, which has made Dayco the partner of choice for vehicle manufacturers around the world. Specializing in power transmission components has enabled Dayco to develop an unparalleled depth of knowledge and to apply it to become a renowned full system supplier to both OEMs and the independent aftermarket alike. The ability to apply technical knowledge to design and develop solutions, and then cultivate those solutions to full series production through large-scale manufacturing facilities, are hallmarks of a well-run and efficient operation. These skills are inherent throughout the Dayco organization. The bold, yet unpretentious branding is emblazoned across the Dayco stand (A71 in Hall 3.0), and is also featured on the new packaging for its many products, whether individual components or kits, including its water pump and heavy duty ranges. Packaging is only one element as the corporate message is also portrayed through all of the Dayco’s marketing material, technical information and via the company’s new corporate – www.dayco.com – and aftermarket – www.daycoaftermarket.com – websites. Commenting on the introduction, Global Marketing & Communications Manager, Franca Pierobon said: “Dayco has built its reputation on its ability to solve the technical challenges brought about by OEMs pushing the boundaries of engine design to produce cleaner, more efficient and smaller power units”.